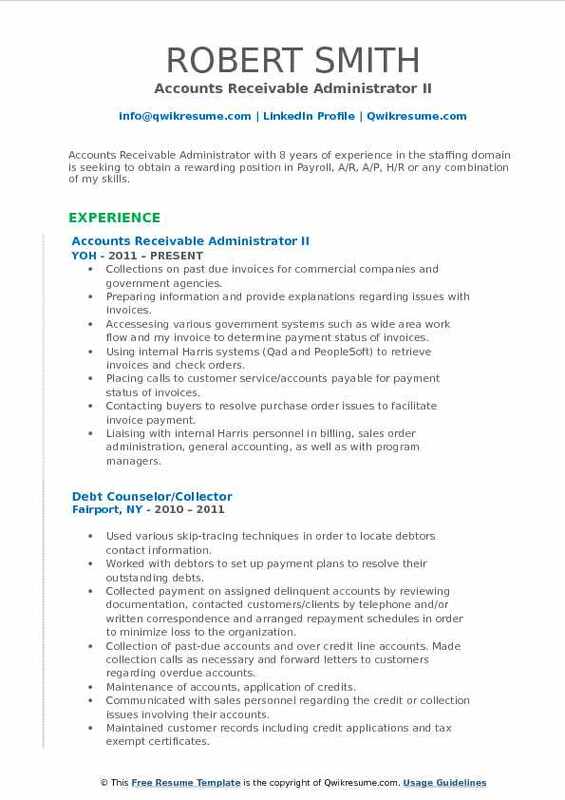 The role of an Accounts Receivable Administrator Resume is to manage customer payments in a timely and accurate manner and contribute towards the growth of customer base by proactive and positive interactions with the customer thereby maintaining the accounts receivable workflow. 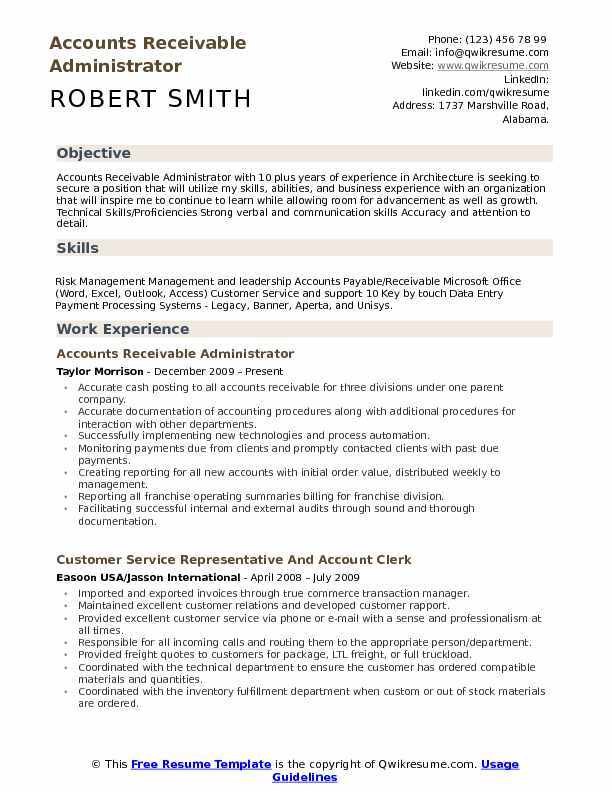 An Accounts Receivable Resume should highlight responsibilities like managing daily cash receipts and other inflow, managing payments for clients invoices and other firms, analyzing bank statements for any discrepancies and responding to client requests for audits or other accounts receivable reports. An individual should also handle duties like reviewing and correcting accounts receivable entries and work with customers for collecting documentation for any outstanding payments. Educational qualifications required are high school diploma and bachelor’s degree in business finance, accounting or equivalent. The skill set needed is excellent verbal skills, good in analyzing and solving issues, self-motivated having a positive attitude, eager learner with a cheerful disposition and ability to work independently. 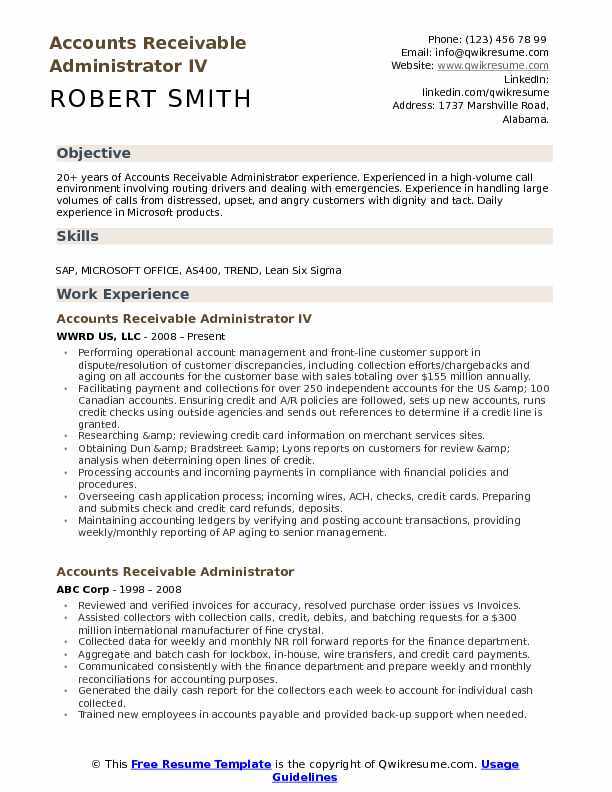 Summary : 20+ years of Accounts Receivable Administrator experience. Experienced in a high-volume call environment involving routing drivers and dealing with emergencies. Experience in handling large volumes of calls from distressed, upset, and angry customers with dignity and tact. Daily experience in Microsoft products. 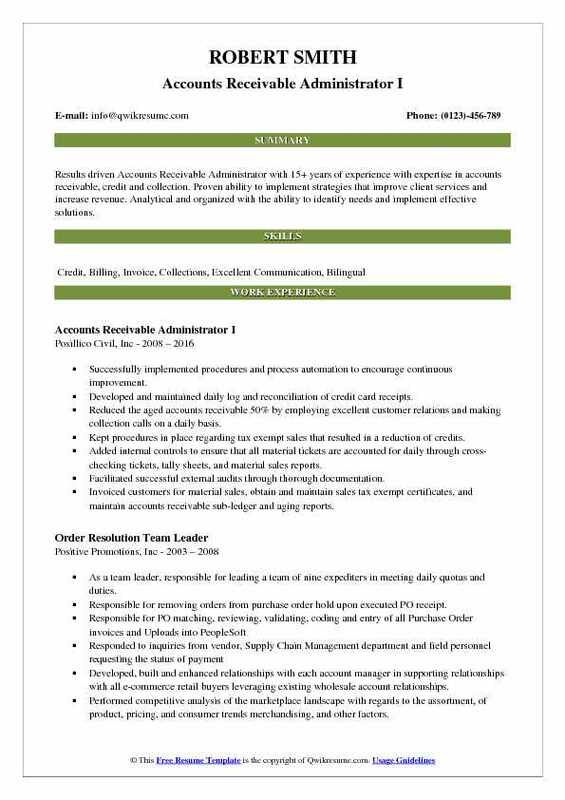 Performing operational account management and front-line customer support in dispute/resolution of customer discrepancies, including collection efforts/chargebacks and aging on all accounts for the customer base with sales totaling over $155 million annually. Facilitating payment and collections for over 250 independent accounts for the US & 100 Canadian accounts. Ensuring credit and A/R policies are followed, sets up new accounts, runs credit checks using outside agencies and sends out references to determine if a credit line is granted. Researching & reviewing credit card information on merchant services sites. Obtaining Dun & Bradstreet & Lyons reports on customers for review & analysis when determining open lines of credit. Overseeing cash application process; incoming wires, ACH, checks, credit cards. Preparing and submits check and credit card refunds, deposits. Maintaining accounting ledgers by verifying and posting account transactions, providing weekly/monthly reporting of AP aging to senior management. Issuing debit/credit memos relating to damages, pricing issues, product quality issues. 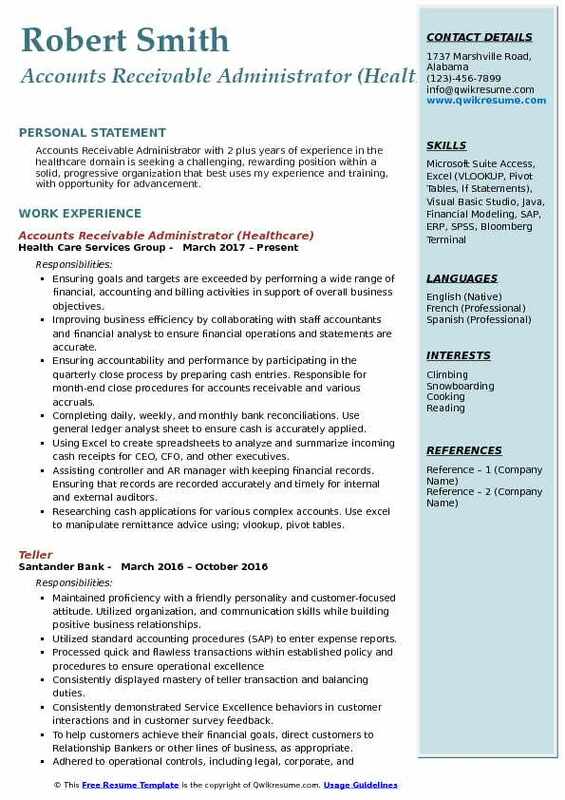 Objective : An experienced, hardworking, multi-tasking Junior Accounts Receivable Administrator with proven accounting, clerical, computer and communication skills looking for an opportunity to be an effective team member and provide outstanding service for an employer and or customers. Skills : Excel, MS Office, Problem solving, Training, Bilingual, PSL And Netsuite. 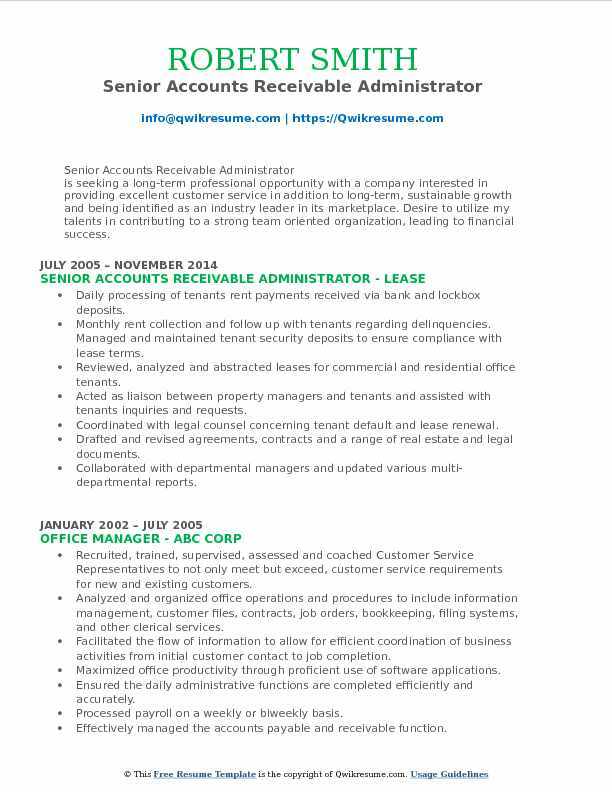 Responsibilities included accounts receivable; bank reconciliations; document management and archiving. Generated reports for management to include cash flow and aging reports. Tracked all client defaults and provided resolutions for and reports to senior management for review and follow-up. Prepared reconciliations of customer account statements; review invoices for completeness; update/correct as necessary. Recorded income received via cash, checks, and credit card transactions. Reconciled customer account statements ensuring the accuracy of the billing; verified account discrepancies by obtaining and investigating information from sales, trade promotions, and customer service department. Researched and resolved delinquent accounts by examining customer payment plans, payment history, credit line and communicating with other departments. Managed transactions according to compliance policies, procedures, and agreements used in international banking. Developed and maintained a user database showing revenue and return matrices; in-flight deals, and bank and underwriter capacities. Presented to management monthly reports on delinquent clients and their status; offered proposals for effective collection solutions. Handled and maintained customer information with utmost confidentiality. Recognized by management for demonstrating adaptability and aptitude for work performed and the high degree of responsibility in the execution of work carried out. 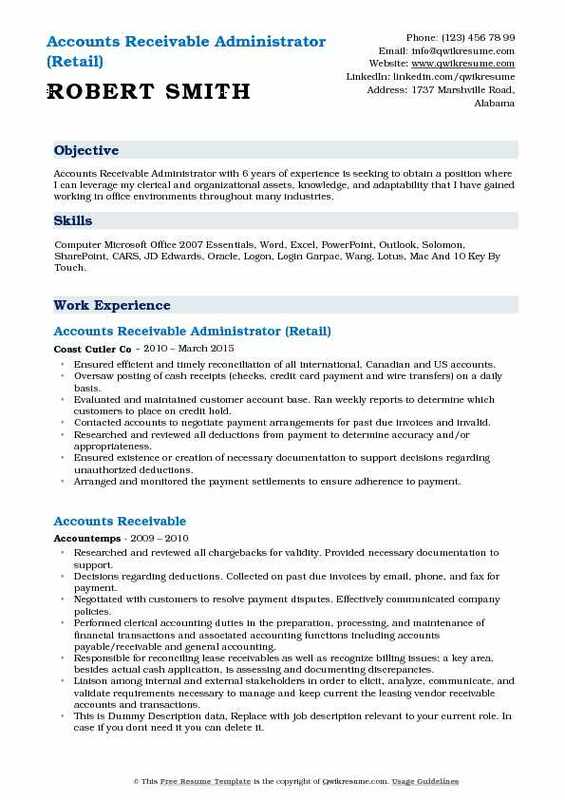 Summary : Results driven Accounts Receivable Administrator with 15+ years of experience with expertise in accounts receivable, credit and collection. Proven ability to implement strategies that improve client services and increase revenue. Analytical and organized with the ability to identify needs and implement effective solutions. Successfully implemented procedures and process automation to encourage continuous improvement. Developed and maintained daily log and reconciliation of credit card receipts. Reduced the aged accounts receivable 50% by employing excellent customer relations and making collection calls on a daily basis. Kept procedures in place regarding tax exempt sales that resulted in a reduction of credits. Added internal controls to ensure that all material tickets are accounted for daily through cross-checking tickets, tally sheets, and material sales reports. Facilitated successful external audits through thorough documentation. Invoiced customers for material sales, obtain and maintain sales tax exempt certificates, and maintain accounts receivable sub-ledger and aging reports. Received, deposited and posted daily cash receipts to the appropriate customer account and/or general ledger account, and troubleshoot any over or underpayments. Prepared and processed purchase orders for material sales and maintain lien release waivers. Invoiced monthly equipment, consulting fees, contaminated soil, G&A administrative, intercompany, rent, labor, safety, and small tools billing. Accountable for credits, write-offs, as well as price and tax adjustments. Administrative duties included covering the switchboard when needed, filing, faxing, scanning, and maintaining a high volume of incoming/outgoing emails and customer phone calls. Summary : Accounts Receivable Administrator with over 14 years experience for a multi-location company; experience includes student billing, bank wires, Oracle Financials, and journal entry. Passionate, detail-oriented, organized, thorough and customer focused. Managing and administering collection and reconciliation of million dollar receivable accounts for all customers. Responsible for reconciliation of several accounts such as cash, inventory, accounts receivable, etc. Leading of weekly and monthly A/R meetings and compiling all reports including KPI information. Chosen to be part of the culture club committee which creates all employee activities. Chosen as a champion to lead the company in creation and rollout of new branding habits. Chosen to head credit management project analyzing all risk exposure to mbx systems by obtaining and evaluating proper financial forecasts and statements to determine creditworthiness and help set and. Chosen as a champion in the creation of strategic building blocks for the company. Recognized for the creation of forecasting tool that is currently being updated by it to work with mbx. Recognized for the creation and implementation of excel workbook that reduced cycle time by several. Recognized for writing and testing all internal documentation for both accounts receivable and accounts. Payable responsibilities and implementing cross-training for all subordinates. Objective : Accounts Receivable Administrator with 2 plus years of experience in the healthcare domain is seeking a challenging, rewarding position within a solid, progressive organization that best uses my experience and training, with opportunity for advancement. Ensuring goals and targets are exceeded by performing a wide range of financial, accounting and billing activities in support of overall business objectives. Improving business efficiency by collaborating with staff accountants and financial analyst to ensure financial operations and statements are accurate. Ensuring accountability and performance by participating in the quarterly close process by preparing cash entries. 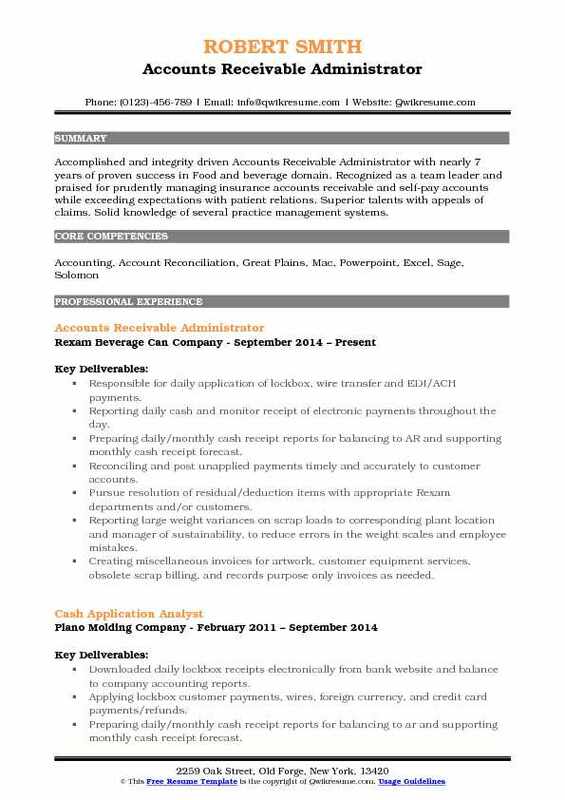 Responsible for month-end close procedures for accounts receivable and various accruals. Completing daily, weekly, and monthly bank reconciliations. Use general ledger analyst sheet to ensure cash is accurately applied. Using Excel to create spreadsheets to analyze and summarize incoming cash receipts for CEO, CFO, and other executives. Assisting controller and AR manager with keeping financial records. Ensuring that records are recorded accurately and timely for internal and external auditors. Researching cash applications for various complex accounts. Use excel to manipulate remittance advice using; vlookup, pivot tables. Maintaining a positive relationship with bank representatives, clients and external account managers. Creating and sending invoices as a billing specialist, to the management companies we service. Responsible for processing reoccurring bills, census billing and using billing change requests to update invoices. Engaging with the management companies we serve to ensure they have billed accurately. Headline : Accounts Receivable Administrator with 6 years of experience is seeking to obtain a position where I can leverage my clerical and organizational assets, knowledge, and adaptability that I have gained working in office environments throughout many industries. Skills : Computer Microsoft Office 2007 Essentials, Word, Excel, PowerPoint, Outlook, Solomon, SharePoint, CARS, JD Edwards, Oracle, Logon, Login Garpac, Wang, Lotus, Mac And 10 Key By Touch. Ensured efficient and timely reconciliation of all international, Canadian and US accounts. Oversaw posting of cash receipts (checks, credit card payment and wire transfers) on a daily basis. Evaluated and maintained customer account base. Ran weekly reports to determine which customers to place on credit hold. Contacted accounts to negotiate payment arrangements for past due invoices and invalid. Researched and reviewed all deductions from payment to determine accuracy and/or appropriateness. Ensured existence or creation of necessary documentation to support decisions regarding unauthorized deductions. Arranged and monitored the payment settlements to ensure adherence to payment. Processed credits to appropriate GL codes to clear bonafide customer deductions from accounts receivable. Effectively communicated company policy regarding payment methods, customer terms, and credit limit to customers and sales representatives. Summary : Senior Accounts Receivable Administrator is seeking a long-term professional opportunity with a company interested in providing excellent customer service in addition to long-term, sustainable growth and being identified as an industry leader in its marketplace. Desire to utilize my talents in contributing to a strong team oriented organization, leading to financial success. 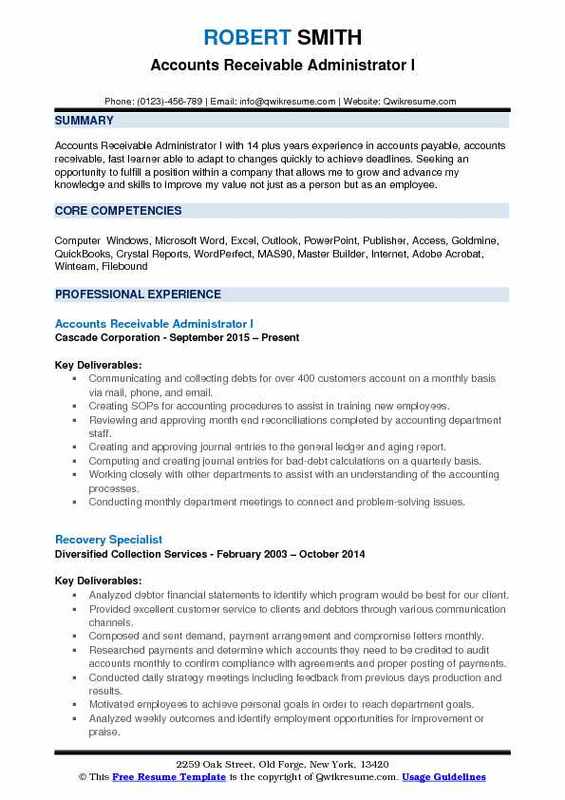 Skills : COMPUTER Microsoft Word, Excel, Outlook, PowerPoint, Adobe Acrobat, Windows, MRI, And Yardi. Daily processing of tenants rent payments received via bank and lockbox deposits. Monthly rent collection and follow up with tenants regarding delinquencies. Managed and maintained tenant security deposits to ensure compliance with lease terms. Reviewed, analyzed and abstracted leases for commercial and residential office tenants. Acted as liaison between property managers and tenants and assisted with tenants inquiries and requests. Coordinated with legal counsel concerning tenant default and lease renewal. Drafted and revised agreements, contracts and a range of real estate and legal documents. Collaborated with departmental managers and updated various multi-departmental reports. Established and maintained effective working relationships with customers. High-volume collection calls to delinquent customers; collecting payments in accordance with their due dates. Headline : Accomplished and integrity driven Accounts Receivable Administrator with nearly 7 years of proven success in Food and beverage domain. Recognized as a team leader and praised for prudently managing insurance accounts receivable and self-pay accounts while exceeding expectations with patient relations. Superior talents with appeals of claims. Solid knowledge of several practice management systems. Responsible for daily application of lockbox, wire transfer and EDI/ACH payments. Reporting daily cash and monitor receipt of electronic payments throughout the day. Preparing daily/monthly cash receipt reports for balancing to AR and supporting monthly cash receipt forecast. Reconciling and post unapplied payments timely and accurately to customer accounts. Pursue resolution of residual/deduction items with appropriate Rexam departments and/or customers. Reporting large weight variances on scrap loads to corresponding plant location and manager of sustainability, to reduce errors in the weight scales and employee mistakes. Creating miscellaneous invoices for artwork, customer equipment services, obsolete scrap billing, and records purpose only invoices as needed. Reporting daily output of billings, credits, and rgrs (return goods records). Posting invoices against purchase orders directly in sap flex to accounts payable as the need arises. 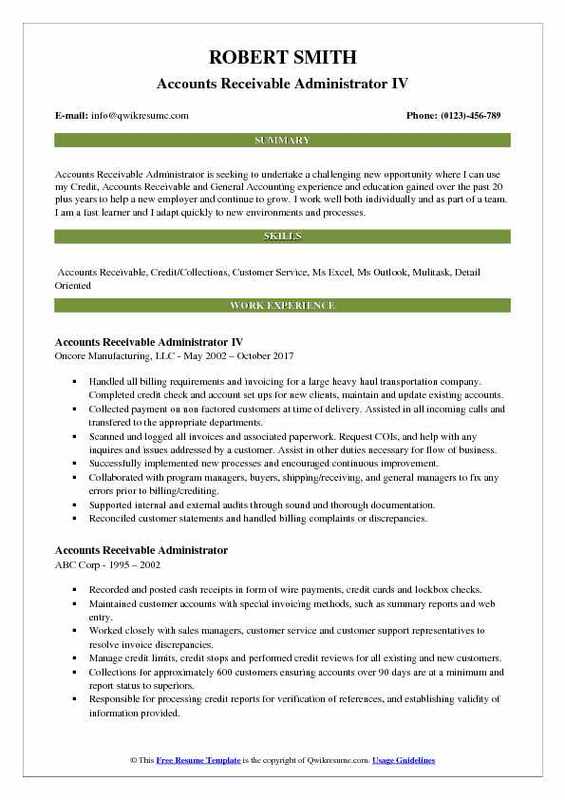 Objective : Accounts Receivable Administrator (Manufacturing) is seeking to obtain a position in a growing organization where my accounting, collection skills, knowledge, and experience can be utilized. Seeking a diverse and challenging position in a team-oriented environment with opportunity for advancement. 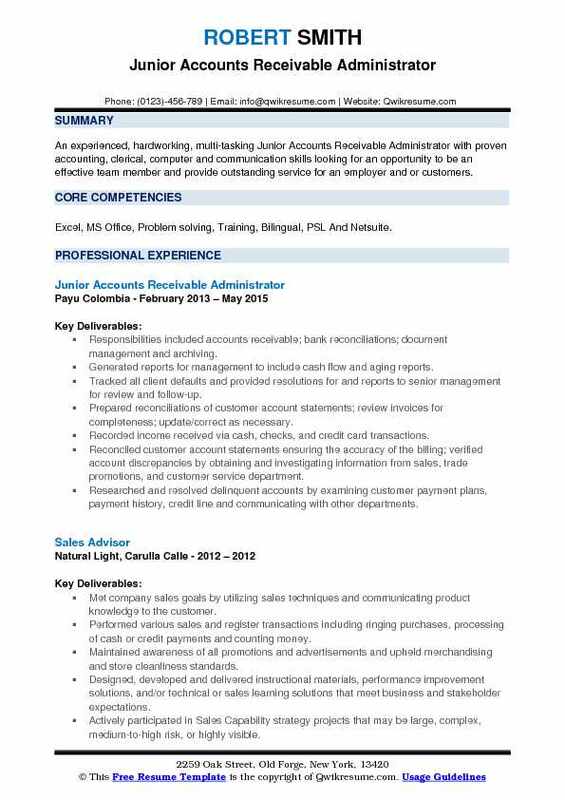 Accounts receivable administrator for over 250 accounts. Calculating, preparing, and issuing bills, invoices and account statements according to established procedures. Reconciling and reporting discrepancies found in records. Communicated with customers, employees and other individuals to answer questions and explain information. Information resource for internal and external customers, responding to and resolving inquiries concerning all billing documentation. Supporting audit of financial statements by providing support documentation and explanation to auditors upon request. Coding and obtaining approvals for accounts payable invoices and input into the accounting system. Monitoring customer accounts to ensure billing and payments are timely, costs are accurate, paperwork is up to date. Accountable for performing credit collections on accounts in the range of current to over 40 days past due. 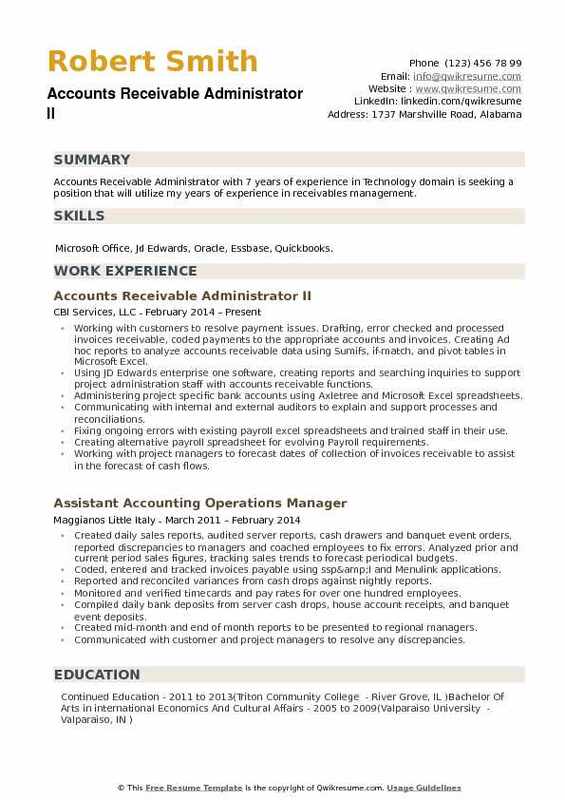 Headline : Accounts Receivable Administrator with 7 years of experience in Technology domain is seeking a position that will utilize my years of experience in receivables management. Skills : Microsoft Office, Jd Edwards, Oracle, Essbase, Quickbooks. Working with customers to resolve payment issues. Drafting, error checked and processed invoices receivable, coded payments to the appropriate accounts and invoices. Creating Ad hoc reports to analyze accounts receivable data using Sumifs, if-match, and pivot tables in Microsoft Excel. Using JD Edwards enterprise one software, creating reports and searching inquiries to support project administration staff with accounts receivable functions. Administering project specific bank accounts using Axletree and Microsoft Excel spreadsheets. Communicating with internal and external auditors to explain and support processes and reconciliations. Fixing ongoing errors with existing payroll excel spreadsheets and trained staff in their use. Creating alternative payroll spreadsheet for evolving Payroll requirements. Working with project managers to forecast dates of collection of invoices receivable to assist in the forecast of cash flows. Reconciling bank and general ledger accounts, worked with on-site and remote coworkers to resolve variances. 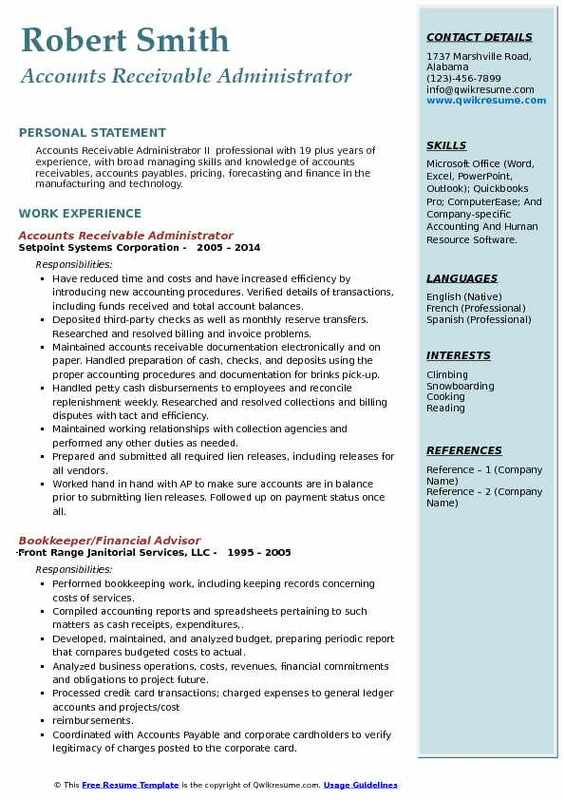 Summary : Accounts Receivable Administrator with 10 plus years of experience in Architecture is seeking to secure a position that will utilize my skills, abilities, and business experience with an organization that will inspire me to continue to learn while allowing room for advancement as well as growth. Technical Skills/Proficiencies Strong verbal and communication skills Accuracy and attention to detail. 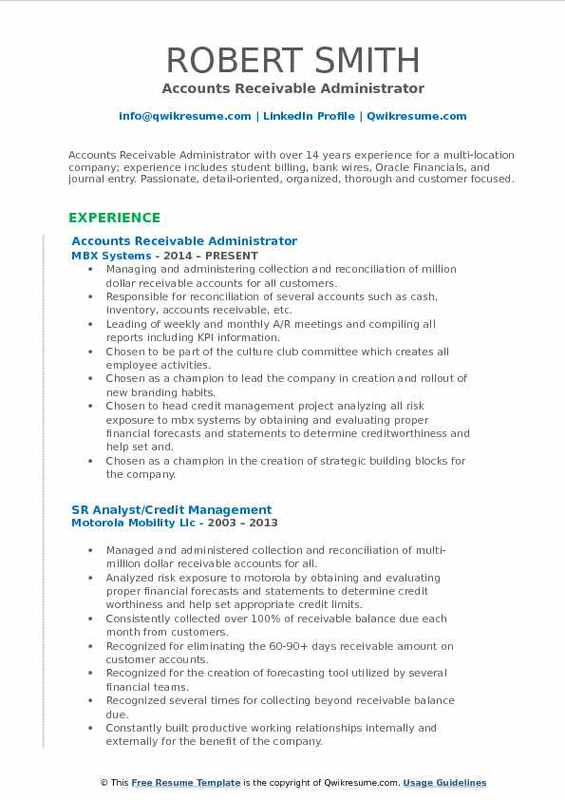 Skills : Risk Management Management and leadership Accounts Payable/Receivable Microsoft Office (Word, Excel, Outlook, Access) Customer Service and support 10 Key by touch Data Entry Payment Processing Systems - Legacy, Banner, Aperta, and Unisys. Accurate cash posting to all accounts receivable for three divisions under one parent company. Accurate documentation of accounting procedures along with additional procedures for interaction with other departments. Successfully implementing new technologies and process automation. Monitoring payments due from clients and promptly contacted clients with past due payments. Creating reporting for all new accounts with initial order value, distributed weekly to management. Reporting all franchise operating summaries billing for franchise division. Facilitating successful internal and external audits through sound and thorough documentation. Reconciling discrepancies between accounts receivable general ledger account and accounts receivable trial. Responsible for customer billing, posting cash receipts to customer accounts, resolving any issues with customer payments, and reporting daily sales activity to management. Balancing and close ar monthly. Coding and enter AP invoices, as well as send out for approvals. Performing various analyses and reconciliations. Summary : Accounts Receivable Administrator I with 14 plus years experience in accounts payable, accounts receivable, fast learner able to adapt to changes quickly to achieve deadlines. Seeking an opportunity to fulfill a position within a company that allows me to grow and advance my knowledge and skills to improve my value not just as a person but as an employee. Communicating and collecting debts for over 400 customers account on a monthly basis via mail, phone, and email. Creating SOPs for accounting procedures to assist in training new employees. Reviewing and approving month end reconciliations completed by accounting department staff. Creating and approving journal entries to the general ledger and aging report. Computing and creating journal entries for bad-debt calculations on a quarterly basis. Working closely with other departments to assist with an understanding of the accounting processes. Conducting monthly department meetings to connect and problem-solving issues. Requesting for change and follow up for change orders to projects with project managers and general contractors. Developing weekly reports of detail aging accounts and sales reports for senior management. Summary : Accounts Receivable Administrator is seeking to undertake a challenging new opportunity where I can use my Credit, Accounts Receivable and General Accounting experience and education gained over the past 20 plus years to help a new employer and continue to grow. I work well both individually and as part of a team. I am a fast learner and I adapt quickly to new environments and processes. Handled all billing requirements and invoicing for a large heavy haul transportation company. Completed credit check and account set ups for new clients, maintain and update existing accounts. Collected payment on non factored customers at time of delivery. Assisted in all incoming calls and transfered to the appropriate departments. Scanned and logged all invoices and associated paperwork. Request COIs, and help with any inquires and issues addressed by a customer. Assist in other duties necessary for flow of business. Successfully implemented new processes and encouraged continuous improvement. Collaborated with program managers, buyers, shipping/receiving, and general managers to fix any errors prior to billing/crediting. Supported internal and external audits through sound and thorough documentation. Reconciled customer statements and handled billing complaints or discrepancies. Responded to customer inquiries and resolved all accounts receivable/payable problems while ensuring the delivery of excellent customer service through fast and accurate data entry. Excellent relationships with clients, superiors, coworkers, and other business professionals. Highly motivated, quick learner, and committed team player with a strong work ethic and multi-tasking abilities. Summary : Accounts Receivable Administrator with 8 years of experience in the staffing domain is seeking to obtain a rewarding position in Payroll, A/R, A/P, H/R or any combination of my skills. 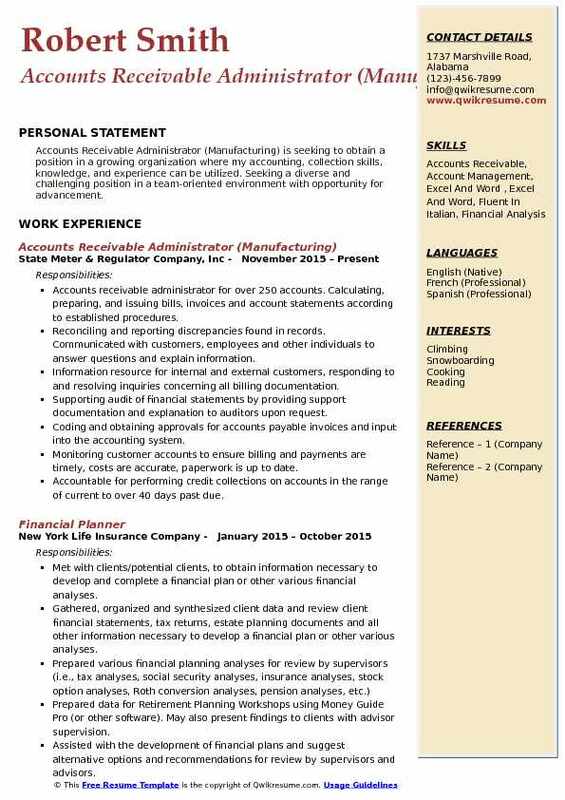 Skills : Accounts Reconciliation, Expertise in Invoice and Payment Transactions, invoice Coding Familiarity, Project Planning, Cash Flow Analysis, Basic Computer skills. Collections on past due invoices for commercial companies and government agencies. Preparing information and provide explanations regarding issues with invoices. Accessesing various government systems such as wide area work flow and my invoice to determine payment status of invoices. Using internal Harris systems (Qad and PeopleSoft) to retrieve invoices and check orders. Placing calls to customer service/accounts payable for payment status of invoices. Contacting buyers to resolve purchase order issues to facilitate invoice payment. Liaising with internal Harris personnel in billing, sales order administration, general accounting, as well as with program managers. Responsible for collecting outstanding balances from client companies such as BP, Spectra Energy, and Chevron. Reviewing, entering and processing payroll for inspectors in the field and invoice client companies for services performed. Summary : Accounts Receivable Administrator II professional with 19 plus years of experience, with broad managing skills and knowledge of accounts receivables, accounts payables, pricing, forecasting and finance in the manufacturing and technology. Skills : Microsoft Office (Word, Excel, PowerPoint, Outlook); Quickbooks Pro; ComputerEase; And Company-specific Accounting And Human Resource Software. Have reduced time and costs and have increased efficiency by introducing new accounting procedures. Verified details of transactions, including funds received and total account balances. Deposited third-party checks as well as monthly reserve transfers. Researched and resolved billing and invoice problems. Maintained accounts receivable documentation electronically and on paper. Handled preparation of cash, checks, and deposits using the proper accounting procedures and documentation for brinks pick-up. Handled petty cash disbursements to employees and reconcile replenishment weekly. Researched and resolved collections and billing disputes with tact and efficiency. Maintained working relationships with collection agencies and performed any other duties as needed. Prepared and submitted all required lien releases, including releases for all vendors. Worked hand in hand with AP to make sure accounts are in balance prior to submitting lien releases. Followed up on payment status once all.